When I first read this quote. I didn’t quite agree with it. I figured that I am only just beginning to understand myself and felt it didn’t apply to me. But after reading it over and over. Literally 20 or more times did I begin to grasp a meaning of my own. For years I was he’ll bent on destroying myself. I seemed to have a death wish and was slowly carrying it out. I lived a life that was not my own. I didn’t have the chance to find out who I was because I always wanted to be someone else. I created, orchestrated, role played and fronted my way through everyday life. I created a monster and payed a heavy price of losing my true self in the process. I destroyed relationships with my family and everyone and everything I came in contact with. I never understood why I did the things that I did. I just did them to be like everyone else. I had no identity of my own so I followed the path of least resistance along with the others. It wasn’t until years later that I began to realize that the life I was living was not for me. It took countless headaches and heartaches, prisons and institutions for me to finally start to understand that I wasn’t meant to live this way. I began to want something more for myself. Something that I had deep down inside of me wanted to be set free. It was a Devine Intervention. It had to be. Because left up to me I would have continued to destroy myself until the bitter end. At that point I began to understand that I was worth so much more. 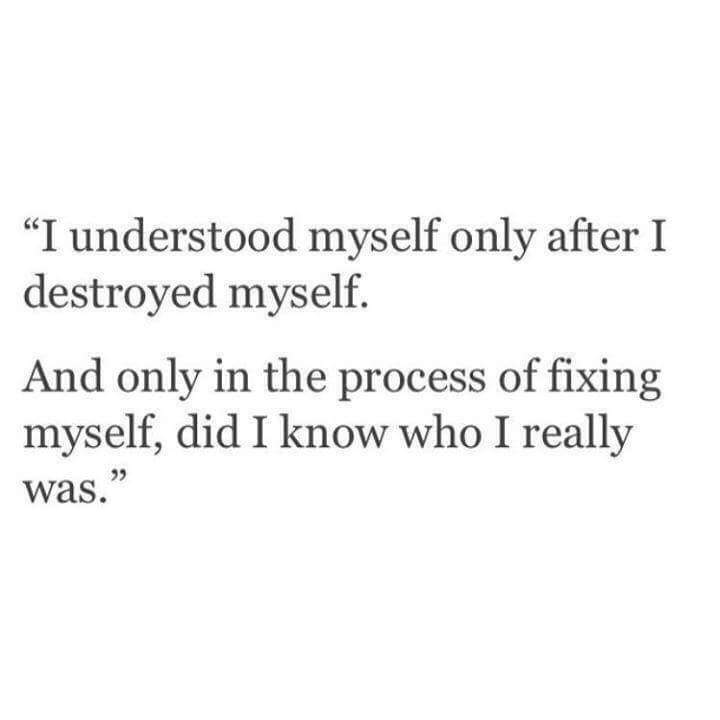 Only in the process of fixing myself did I know who I really was. This last part speaks of my recovery process. Coming into recovery through the guidance of my Higher Power. Learning how to put my ego and my pride in my back pocket and listen, take suggestions and do some things differently. Relearning how to be honest with others but more importantly learning how to be honest with myself. Learning how to just get through the day without using. Talking about my feelings and not stuffing them until they overflow and I explode. Learning how to be a friend and to have compassion and empathy. Not being afraid to cry and learning how to identify and work through feelings. In my process uncovering and exposing the lies that I have lived with and believed all my life. Seeing myself for the first time and realizing that I am a nice person. I am intelligent, gifted, caring, vulnerable, worthy, useful, helpful and trustworthy. Learning that I am going to make mistakes and it’s ok. That I don’t have to be perfect. Learning how to say no and not worry about hurting someone’s feelings. That I don’t have to be a people pleaser so I can fit in or belong. I am who I am. Like it or leave it. Today I have choices. I am responsible, I am getting my voice, I am no longer silent and invisible. I have a purpose. Thanks to this process of fixing myself I am getting to know the real me. This entry was posted in 2015 and tagged addiction, process, progress, recovery. Bookmark the permalink. I’m so very happy for you. Congratulations. Closely Relate it to myself….am I Eric Ease? Thank you sharing your identification. I guess you can say that we are all more alike than different. So I am you and you are me. That’s why it’s a We process. Identification. Amen Eric. I love the last part especially. The last 3 paragraphs I think it is. Thank you George. I believe that today. It took some time but I really do. I no longer feel worthless and useless. I can see that I have potential and a purpose. Have a great day and enjoy your holiday my friend.